My Van Gogh is not ill, nor mad, nor even brilliant. He is dead. This characteristic – fairly widespread among artists born in the 19th century – takes on special significance in his case, since Vincent van Gogh seems to have become the most living dead person in Arles. Before becoming a visual artist, I was interested in legends, in anthropology and to some extent in occultism. I am familiar with revenants, whether the ones in the Icelandic sagas or the zombies of Haiti. In 2015 I published my second novel, Temps mort, which is about the difficulty of returning. 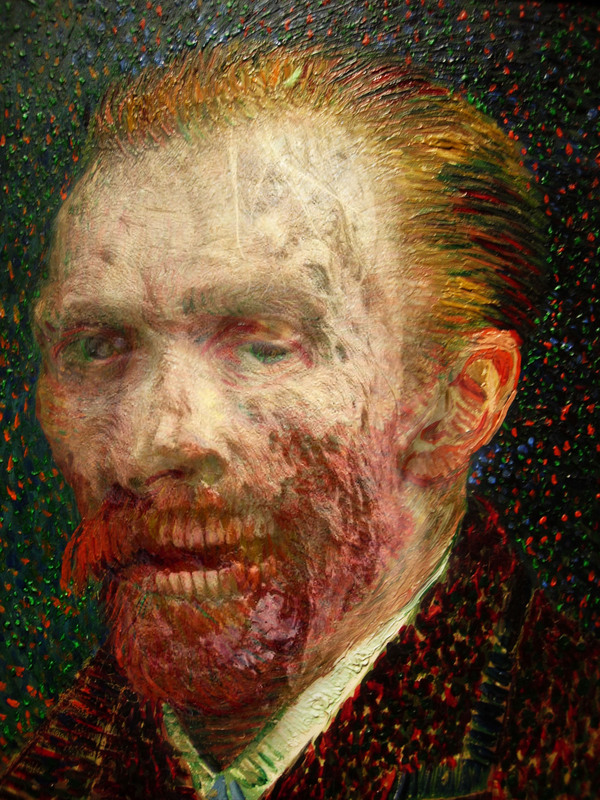 For the cover, we used a self-portrait of an undead Van Gogh, created for the Zombies exhibition held in 2014 at the Collectif E3 gallery. Since my arrival in Arles, the painter-pilgrim has inspired me to make several works on the theme of the rejected Vincent’s return to the city. The fantasy figure of the deceased fits naturally into a city of wind and sun that is also built on top of a large necropolis. One year ago the Fondation asked me to create a set of drawings about the presence of Van Gogh in Arles, including even in promotional merchandising goodies. I find this popular appropriation of Van Gogh’s person fascinating: a commercial sacrilege that is at time ridiculous. But I also propose to consider it a form of haunting. Because it is not easy to get rid of a revenant. This latter is defined by an enormous appetite and by the impossibility of satiating its emptiness. As an artist, I cannot help but explore this living absence, this paradoxical presence – rather like touching with your tongue the gap left by an extracted tooth. Masked or unmasked, my gaunt Van Gogh staggers along the road, his face changing like those of apparitions. A mighty painter afflicted by a bad death, he becomes a spirit that we can invoke, a Loa voodoo painting, a fetish. There is nothing morbid or depressing in this colourful carrion: on the contrary, humour, life and detachment take root in it, so as to transform the soil of a tomb into the fresh blossom of an almond tree. Born in 1976 in Bordeaux near the Public Garden, in a district populated with birds, carp, old men and gardeners, Thibault Franc studied philosophy. Rather than turn to teaching, he experiments with other modes of interaction and other forms of knowledge, through botany, martial arts, trips to Africa, and a studio at street level, first in Bordeaux and then in Arles. His artistic and literary creations serve as apprehensions of a fragmented world. Through his assemblages of related images or composite objects, he attempts to reverse entropy and contain centrifugal forces. His delight in misappropriating words, forms and objects is not indulged at random, but is consciously anchored in a geographical region and around its local mythologies.